Contracting-out non-state providers to deliver a minimum package of essential health services is an increasingly common health service delivery mechanism in conflict-affected settings, where government capacity and resources are particularly constrained. Afghanistan, the longest-running example of Basic Package of Health Services (BPHS) contracting in a conflict-affected setting, enables study of how implementation of a national intervention influences access to prioritised health services. 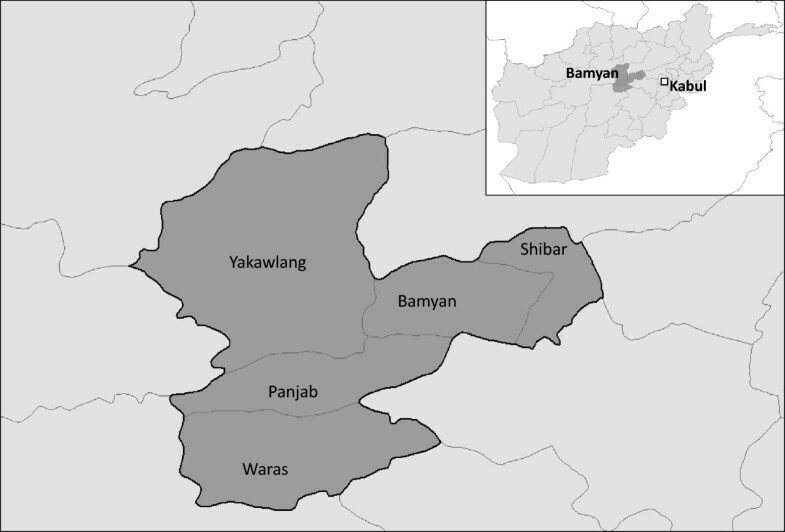 This study explores stakeholder perspectives of sexual and reproductive health (SRH) services delivered through the BPHS in Afghanistan, using Bamyan Province as a case study. Twenty-six in-depth interviews were conducted with health-system practitioners (e.g. policy/regulatory, middle management, frontline providers) and four focus groups with service-users. Inductive thematic coding used the WHO Health System Framework categories (i.e. service delivery, workforce, medicines, information, financing, stewardship), while allowing for emergent themes. Improvements were noted by respondents in all health-system components discussed, with significant improvements identified in service coverage and workforce, particularly improved gender balance, numbers, training, and standardisation. Despite improvements, remaining weaknesses included service access and usage - especially in remote areas, staff retention, workload, and community accountability. By including perspectives on SRH service provision and BPHS contracting across health-system components and levels, this study contributes to broader debates on the effects of contracting on perceptions and experiences among practitioners and service-users in conflict-affected countries. Health service provision is particularly challenging in countries affected by or emerging from armed conflict, due to interrelated constraints including destruction of health infrastructure, death and migration of health workers, insufficient domestic resources, and weak governance [1–3]. Non-state providers, particularly international non-governmental organisations (INGOs), often play an important role in addressing health needs during and after conflict [4, 5]. However, these parallel health services are not designed for long-term sustainability, potentially weakening national health systems and consequently undermining the state-building process [6–8]. Linkages between effective service delivery, health system strengthening, and state-building are becoming clearer [2, 3, 7, 9, 10], including the role of non-state providers in this process [4, 5, 11, 12]. However, empirical data remains limited on how the international community can best support the transition from a fragile post-conflict country, often largely dependent on international support, to a sovereign state capable of serving its citizens in an effective and sustainable manner. One approach to improving access to healthcare services after armed conflict, and thereby contributing to the state-building process, is providing a Basic Package of Health Services (BPHS) for all citizens [13–15]. This package prioritises effective primary healthcare interventions (e.g. maternal health, communicable disease control) to address population-level disease burden cost-effectively and equitably . A widespread BPHS delivery mechanism in conflict-affected settings, where government capacity and resources are particularly constrained, is contracting of non-state providers to manage service delivery [17–19]. Providers, contracted through competitive bidding to supply services against predetermined performance targets, are financed, coordinated, and monitored by national governments with support from international donors. BPHS contracting offers potential for rapid scale-up of standardised health services [17, 20, 21]. First introduced nationally in Afghanistan in 2002, BPHS-centred approaches have been adopted in several countries since (e.g. South Sudan, Liberia, Somalia, Sierra Leone, the Democratic Republic of Congo, Timor Leste) [14, 22]. Community and facility-based primary health services in Afghanistan are provided through the BPHS under stewardship of the Ministry of Public Health (MoPH) . Three major donors fund services in rural areas of all 34 provinces (i.e. USAID in 13 provinces, World Bank in 11 provinces, European Commission in 10 provinces), contracted predominantly through international and national NGOs. BPHS components are (i) maternal and newborn care, (ii) child health and immunisation, (iii) public nutrition, (iv) communicable disease treatment and control, (v) mental health, (vi) disability and physical rehabilitation, and (vii) essential drugs supply. Afghanistan, the longest-running example of BPHS contracting in a conflict-affected setting, provides a useful case study for exploring how implementation of a national health intervention influences access to prioritised health services . Analysts reported that efforts to improve healthcare access in Afghanistan through the BPHS were constrained by inadequate infrastructure and transportation, restrictive cultural norms, lack of skilled female staff, high out-of-pocket expenditures, reduced access in remote areas and winter months, and inadequate quality of care [24–26]. Routine BPHS evaluation is primarily quantitative, through the Balanced Scorecard approach (e.g. minimum staffing levels achieved, provision of ANC services). Though crucial, this approach remains incomplete. It is limited in its ability to provide explanations for differences in performance or allow for assessment of staff and user perspectives . Inclusion of qualitative research can explore wider systems issues through the perspectives of providers translating policy into practice or service-users experiencing the practical aspects of policy [14, 28]. Very little qualitative research has been conducted to explore whether the BPHS strengthens the health system and builds capacity and leadership within national government [29, 30]. The study aim was to explore health-system ‘practitioner’ (e.g. policy-makers, managers, frontline providers) and ‘service-user’ perspectives on provision of sexual and reproductive health (SRH) services through BPHS contracting. SRH services were chosen because: (i) SRH cuts across several BPHS components and (ii) SRH was prioritised in both MoPH and donor agendas during BPHS development in Afghanistan due to some of the highest maternal and infant mortality rates in the world having been recorded in the country [27, 31]. The research question, ‘In what ways has the BPHS affected SRH service provision?’ was intentionally broad to capture a diversity of insights. Objectives were to: (i) describe varied health-system perspectives, using the WHO framework and (ii) identify significant perceived improvements and weaknesses in SRH services under the BPHS. This study focused on service provision in Bamyan province. Largely rural, with BPHS coverage, it was selected for relative remoteness and research-staff security. Bamyan, in central Afghanistan, is the cultural centre of the Hazara – an ethnic and religious minority that have experienced long-term discrimination. High altitude, rugged terrain, and long winters impede health service provision for most of the 418,500 inhabitants. Three NGOs, IbnSina, Aga Khan Health Services of Afghanistan, and Agency for Assistance and Development of Afghanistan, provide the BPHS with USAID and other funding. A qualitative research design, as described in Lincoln and Guba, incorporated in-depth interviews with health-system practitioners and focus group discussions (FGDs) with service-users . Participants were recruited by AtV and LO. A systems approach, informed by Reid and colleagues’ four-levels model , guided participant selection. This model situates healthcare within four interconnected levels: (1) service-users, (2) frontline providers (e.g. doctors, midwives, pharmacists, community health workers), (3) healthcare organisations (e.g. facilities through which healthcare is provided), and (4) healthcare environment (e.g. the political, financial, regulatory regime in which healthcare is organised). Ferlie and Shortell suggest that whether intended changes are bottom-up, top-down, incremental or radical, efforts should address all health-system levels to maximise likelihood for success . For the purposes of this study, SRH services included maternal and newborn health, contraception, and sexually-transmitted infection (STI) and HIV prevention and treatment. In-depth interviews, using purposive sampling for diversity of opinion, were planned with key informants from three health-system levels who had developed, implemented, or evaluated BPHS services nationally or in Bamyan province: (Reid et al’s level 2) frontline providers, (level 3) health facility supervisors and managers, and (level 4) donors and policy-makers – see Table 1. In-depth interviews were conducted in English, face-to-face in Bamyan or Kabul by AtV (in locations selected by participants) or via telephone by LO. Interviews were digitally recorded and transcribed professionally with quality checks by AW and DP. NB: aBPHS was not implemented in Kabul city. Thus, Kabul women were considered BPHS non-users, Bamyan women attending a BPHS facility were users, and Bamyan women living at a distance from a BPHS facility were considered potential users. FGDs, using purposive selection for maximum between-group variation, were planned with SRH service-users (i.e. Reid et al’s level 1) in rural Bamyan province and urban Kabul city - see Table 1. Kabul service-user FGDs were intended as a pragmatic comparison of reported SRH service access and quality in a populated urban area without BPHS implementation. Bamyan service-user selection was based on distance to nearest BPHS facility, to explore how this might affect service usage in this rural province. Kabul service-user selection was similarly based on distance to nearest referral hospital. Investigators attempted to include a mix of incomes and education levels among FGD participants where possible. FGDs, of approximately 8–12 female participants each, were facilitated in Dari by NA. FGDs were digitally recorded and transcribed and translated by AS. Inductive thematic coding used the WHO Health System Framework indicators (i.e. service delivery, workforce, health information, access to medicines, financing, stewardship), as the BPHS is a horizontal approach that affects the whole health system and many practitioners are familiar with the WHO framework . Two authors separately applied a preliminary coding framework to the first transcript. Coding was compared for consistency and the framework adapted as necessary. Once the final coding framework was agreed, remaining interviews were divided and coded. Reporting adhered to RATS criteria for qualitative research . All participants received and were read study information sheets and written or verbal informed consent was recorded. Interviews and FGDs were conducted confidentially and recorded anonymously using numerical identification. Ethics approval was provided by the MoPH Institutional Review Board in Afghanistan and the London School of Hygiene & Tropical Medicine Research Ethics Committee in the United Kingdom. Twenty-six in-depth interviews were conducted with health-system practitioners (i.e. 18 face-to-face, eight phone) in 2010 and 2012. Nine potential interviewees did not respond to invitation or follow-up, but did not obviously differ from interviewees with respect to job description or gender. Interviews in 2012 explored initial access and accountability findings in more depth. Six participants were primarily frontline providers (i.e. Reid et al’s level 2). Ten participants were primarily supervisors and managers (i.e. level 3), though four reported additional frontline duties and seven reported some policy-influencing activities. Ten were primarily policy-makers and advisors (i.e. level 4), though five reported additional managerial responsibilities. Demographically, 72% were Afghan, 49% female, and they worked as UN/bilateral donors or technical advisors (19%), government staff (46%), and/or civil society/non-governmental organisation (CSO/NGO) staff (58%). There was considerable overlap, particularly between government and CSO/NGO staff – see Table 1.Four FGDs with SRH service-users were conducted in 2009–2010. Two in Bamyan province included: (a) higher-income women presenting at a Basic Health Clinic in Bamyan district (i.e. ‘BPHS users’), and (b) lower-income women in a village two hours walk from the nearest BPHS facility in Shibar district (i.e. ‘potential BPHS users’) - see Figure 1. Two in Kabul city included: (c) non-educated low-income female SRH service-users living in District 1 Kabul, and (d) somewhat-educated higher-income female SRH service-users living in District 4 Kabul. All women recruited agreed to participate. Additional planned FGDs were not conducted due to funding constraints. Results are reported under five WHO health system categories, sub-categorised by emergent themes. ‘Access to medicines’ was excluded as no participants discussed this in relation to SRH. Perspectives of health-system practitioners (i.e. Reid et al’s levels 2–4) and SRH service-users (i.e. level 1) are reported separately, as authors found a natural dichotomy between these perspectives. Unless otherwise indicated, service-user quotes are from Bamyan FGDs. Health-system practitioners reported increased SRH coverage under BPHS contracting. Despite improved coverage and better security, facility access in parts of Bamyan remained challenging. Female health-workers and mothers living in hard-to-reach areas were particularly hampered by distance, poor roads, and lack of transportation. One midwife commented this reduced her ability to respond to pregnancy complications. Bamyan providers reported increased demand and usage of SRH services under BPHS contracting - particularly demand for family planning services, which reportedly “increased by two-fold” even among those living at greater distances from facilities. Practitioners reported minimal increases in STI services usage despite needs. Providers described patients as ‘shy’ about discussing sensitive health issues, potentially contributing to STI treatment-seeking delays. Practitioners similarly explained low numbers of facility deliveries as cultural preference, advocating better health promotion and ‘trust-building’ efforts to increase service demand and usage. Perceived socio-cultural barriers to SRH service usage included female role expectations. Service-users in Bamyan reported improved SRH service coverage and access since establishment of the local BPHS clinic. Previously, they either attended a hospital that was “very far” by ambulance or car or were treated and delivered at home. Distance-related differences in service usage were reported, with nearby women using services routinely and distant women using them for emergencies only. Distant participants usually delivered at home with a daya (i.e. traditional birth attendant). When asked if they preferred to give birth at home or clinic, women unanimously responded the latter if feasible. Distance-related knowledge differences were also apparent. FGD participants living near a BPHS facility – and thus more likely to use services – could identify several family planning methods and expressed positive attitudes towards modern contraceptives, birth spacing, and not having ‘too many’ children. FGD participants living two-hours from a BPHS facility reported that their family planning knowledge was poor, contraceptives could lead to infertility, and pregnancies could not be planned but ‘just happen’. Women in both Bamyan and Kabul identified social demands, particularly childcare, as barriers to SRH service usage. Health-system practitioners reported that improvements in coverage and usage reflected increased provider numbers and quality, particularly female staff numbers. However, more female staff - across all SRH cadres (e.g. doctors, nurses, midwives, CHWs) - were reportedly required. For example, at least two midwives were required to provide 24-hour basic emergency obstetric care. Practitioners agreed a need for continued capacity-building and training of government staff at all levels. Perceptions of improved service quality were often framed in terms of increased training and standardisation. Midwifery training was particularly praised. Community-based care, an important BPHS component, is most visible as female community health workers (CHWs). Practitioners generally reflected positively on this, with CHWs playing an important role in contraceptives provision and community trust-building (e.g. encouraging facility deliveries). However, several acknowledged CHW capacity was low and expected workload significant. Despite low CHW capacity and heavy workload, some argued that CHW roles could be expanded to include full antenatal care (e.g. blood pressure, weight measurement) and even uncomplicated deliveries. Others acknowledged the challenges of motivating volunteers. High staff turnover was reportedly problematic. Service-users reiterated practitioner views that more health workers were needed, particularly clinical staff (e.g. doctors, nurses), though they did not specify female providers. Practitioners reported improved SRH monitoring and evaluation under the BPHS, most acknowledging the combined effort of donors, MoPH, and NGO sub-contractors. Several described implementation of the balanced scorecard, annual national monitoring checklist, and increased research and documentation as evidence of improvement. Project managers and donors focussed on the need for additional indicators (e.g. community-based activities, supervision of new health workers), while providers focussed on the data collection burden of existing indicators and reporting mechanisms. One manager said the balanced-scorecard could not detect ‘real’ service quality. However, most practitioners discussed the difficulties of determining whether quality of care had improved, due to reporting inconsistencies and perceived data inaccuracies. While one donor said improving SRH services quality measurement was “an immediate need,” most practitioners said quality improvements “just take time”. Several said more SRH-specific funding was needed to further improve and expand SRH service delivery, while others favoured funding all primary healthcare needs equally. Tracking of BPHS component funding remained challenging. Practitioners suggested flexible financial incentives could help retain health-workers in challenging areas. Bamyan practitioners suggested an incentive system could encourage female doctors from rural areas to return after medical school, though national standardisation of salary policy minimised opportunities for such concessions. An NGO advisor noted that rural health-workers were generally less satisfied about their salaries. Bamyan practitioners suggested financial incentives could improve CHW motivation. CHWs, though officially volunteers, were sometimes reimbursed for delivery referrals using non-BPHS funding. Both CHWs and dayas often received informal payments from families. Non-financial incentives were suggested to encourage service-user attendance (e.g. antenatal care). SRH users reported travel expenses, and fees in non-BPHS areas, limited access. Bamyan service-users confirmed they were not charged for health services, but travel costs could be significant. Kabul service-users identified financial barriers as most significant in receiving care. Out-of-pocket expenditures were reported as particularly difficult in this non-BPHS area, even for higher-income users and despite regulations stipulating services in public facilities be provided free-of-charge. Most expected SRH to remain a BPHS priority even if new components were introduced (e.g. mental health, disability). SRH components were considered equally important, though some identified maternal care as a focus, followed by family planning. A government official noted strong advocacy for community midwifery education (CME) within MoPH, while several noted that gender violence and equity remained sensitive issues. Practitioners agreed that health-system coordination had improved during BPHS implementation. Cooperation between MoPH and other stakeholders (e.g. NGOs, UN agencies, donors) was noted during national and provincial planning and BPHS revisions. However, coordination challenges were identified for health information, primary and secondary healthcare, provincial and district hospitals, public and private sectors, and donors. Practitioners noted that health information management at government and facility levels could be more effectively coordinated (e.g. data sharing between the SRH directorate and MoPH, cooperation between Maternal Health Units and Integrated Maternal/Child Health Nutrition units). Greater coordination between MoPH and other ministries (e.g. Ministry of Economic Planning, Ministry of Education) would improve accountability. Primary and secondary healthcare coordination required further strengthening, with the referral system - particularly for obstetric complications – still regarded as weak. One practitioner noted the lack of night-time communication between district and provincial hospitals (i.e. radio operators worked during the day). Another explained that patients with complications went to the provincial hospital, avoiding health facilities. Most practitioners said the BPHS, particularly contracting-out mechanisms, had improved accountability to MoPH and donors. However, several expressed uncertainty about the extent of accountability to communities. One senior manager said limited education reduced community self-advocacy, while others reported the BPHS stimulated community involvement. Many service-users noted progress. One BPHS-user mentioned that mobile phones and community ambulances enabled families to arrange their own hospital transport. However, perspectives also reflected discrepancies between donor and community accountability. Women reported not knowing whom to contact should they experience problems with BPHS staff, making accountability at this level challenging. Improvements in Bamyan were noted by participants in all five health-system components discussed, with key perceived improvements identified in SRH service delivery, particularly coverage and SRH workforce (e.g. in improved gender balance, numbers, training, standardisation). Important remaining weaknesses included service access, usage, staff retention and workload. Community accountability findings were equivocal. Many service-users and potential users still considered access challenging. Despite increased facilities, travel restrictions due to security, cost, and distance (e.g. poor roads, expensive/unavailable transport, dangerous weather) still influenced care-seeking choices in Bamyan. A travel reimbursement system, such as that piloted in Badakhshan province, and improved ambulance services could reduce travel cost and availability barriers, particularly for obstetric emergencies. Strengthened community-based services (e.g. community midwives, CHWs) could help reduce security and weather-related travel barriers. There were notable disparities between practitioner and service-user responses on facility deliveries, with practitioners emphasising cultural barriers and service-users discussing logistical difficulties with access. Unfortunately, the reduced number of FGDs did not allow for deeper exploration. However, Speakman and colleagues report increased usage of skilled birth attendants once they became available in communities, suggesting that demand for safer deliveries may outweigh perceived cultural barriers in rural areas . Follow-up is needed to determine the most effective approaches to promoting facility deliveries and skilled attendance at every birth. Retention is challenging when staff have attractive opportunities elsewhere. It is perhaps unsurprising that rural and remote postings were unpopular with many providers, yet as Petit and others note, the BPHS depends on rural health-staff for community-based services [14, 16, 24]. Lack of appropriate incentivisation, recruitment and retention – particularly of female staff – will likely challenge scale-up of BPHS services at both community and facility levels . Workload, particularly for midwives and CHWs, is a related challenge. CHW acceptability remains an issue, with some policy-makers advocating increasing their role beyond family planning advice and referral and others questioning their capacity. CHWs are not a solution for life-threatening cases nor could they replace skilled birth attendants. However, their remit is likely to expand given the continued need for low-cost primary healthcare . Health information and financing for SRH services, despite ongoing challenges, appear to have improved since BPHS initiation, due to significant international financial and technical support [23, 40, 41]. Among SRH service-users, out-of-pocket expenditures in non-BPHS areas were an important access barrier, suggesting the initial BPHS focus on under-served rural areas did increase access in Bamyan [24–26, 42]. Authors support the 2012 BPHS expansion to urban areas, including Kabul city, as a way to increase health equity. Weak community accountability is not uncommon in fragile contexts such as Afghanistan, as governance structures are often insufficient for the ‘long route’ of accountability to be effective (i.e. citizens holding the state accountable using their ‘voice’ , via elections or advocacy activities, and the state ensuring providers fulfil agreed responsibilities) [43–47]. However, findings on community accountability were equivocal. Accounts indicated uncertainty among service-users about accountability mechanisms, without clarifying whether mechanisms existed or not. Follow-up is needed to provide additional insight. Due to time and security constraints, a reduced number of interviews and FGDs were conducted. This limited numbers of health-system perspectives, particularly those of CHWs and service-users, and restricted exploration of differences between Bamyan service-users. Interviews and FGDs focussed on health services in Bamyan, a culturally and geographically unique province, thus results are not generalisable across Afghanistan. The reality that changes take time was demonstrated in 2012 follow-up interviews, in which the same problems were discussed and results found as in 2009–2010 interviews. BPHS contracting is increasing in post-conflict settings, with some notable success in improving SRH access and outcomes [14, 48]. This study contributes perspectives on SRH service implementation through BPHS contracting across health-system components and levels in Afghanistan. Some findings were to be expected (e.g. continued geographical access difficulties, increased health workforce and retention challenges, improved health information), while others were perhaps more surprising (e.g. practitioner and service-user differences in reported delivery preferences, the significance of financial barriers in non-BPHS areas - even among relatively higher-income service users). This exploration of SRH services delivery in Bamyan contributes to broader debates on the effects of health service contracting on perceptions and experiences of health services provision among practitioners and service-users in conflict-affected areas [7, 14]. Authors thank participants for their time and the RAISE initiative for funding research. RAISE was not involved in design, analysis, or publication of this manuscript. Thanks to Zakia Haddy for interpretation and translation. Thanks to Katherine Footman of LSHTM for contributing the figure and Adam Koon of LSHTM for reviewing an earlier manuscript version. NH and AW analysed data and wrote the manuscript. DP contributed to data analysis, manuscript writing, and critical review. AS translated and analysed FGD data and contributed to critical review. AtV, NA, and LO collected data and contributed to critical review. ES contributed to critical review. BR designed the study protocol and contributed to interpretation and critical review. All approved the version for submission and agreed to be accountable for the work.